This placemats and napkin set or table mat napkin set is made of block printed canvas cotton fabric. Thick fabric helps placemats stay firmly on the table. The bright and pleasant colourful floral designs go well for summer and spring home décor. 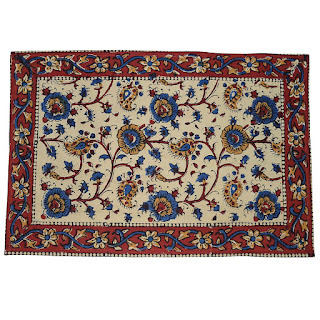 These serves as decoration, especially placemats made from cotton or silk. These are handcrafted by craftsmen of Jaipur in Rajasthan, India. These dinning placemats that will add charm to your Dining Table. This elegant range of placemat set gives dining table setting an elegant and complete look with their vibrant colour combination. Choose from complete sets that come with placemats and napkins set. These are easy to wash at home and maintain as well. This will not only transform the complete look of your table but will also become a staple for every occasion.